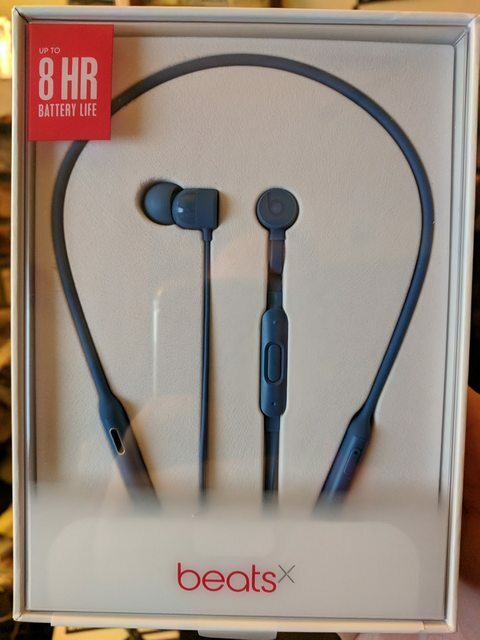 Hey, new wireless headphones to take on my walks! I had tried some other wireless headset recently, and they were ok for a day. Then they went to garbage mode the next day. I hope, spending a little money will mean better headphones. I have never owned beats headphones, but have really only heard negative things. I read a reviews about these working really well. I figured I would give them a go. I went for a walk tonight, and overall they worked well. There was a few connection drop outs, but that might just be my Pixel XL’s bluetooth tech. So I hope they will continue to work at least as well as they did tonight. I was late on my eating tonight. I was talking with my wife about the new desk she bought. I get to put it together still. Suddenly, I realized it was 5 pm. So I was done by 5:30 pm. I forgot to add a couple of little victories yesterday. First, I realized that I was low enough weight to use my Fitbit Alta scale again. I thought I had to be under 330 lbs, but I guess the limit is 350 lbs. 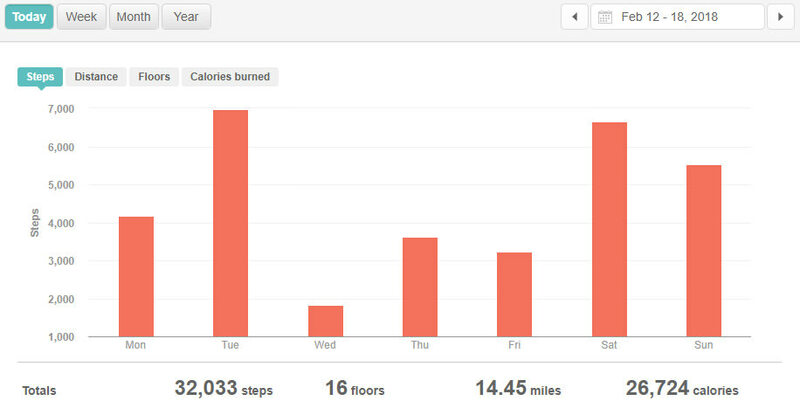 I think I will start using it now, since it auto reports to my fitbit account. Second, I fit into my older clothes. At least some of them. Currently, I am wearing 4xlt (long tall to give me plenty of room to cover the gut) Well, I tried on my old 3xlt’s and it looked like they fit. I even tried on a 2xlt “muscle” shirt, and it fit decently too. Just slightly tighter. MyFitnessPal Food Diary. 1778 Calories, 12 net carbs. Food went fine. I was eating a little past 5 pm. The Togo’s Pastrami in a bowl was pretty good. 2.08 miles, 40 minutes. I think the Endomondo app didn’t quite track my entire walk. I spent 10 or 15 minutes walking around in a small circle area. I had to battle and take over a Pokémon Go gym! 12:07 am to 7:10 am. Sleep was pretty good, though I was woke up early by a message on my phone. We needed to get up earlier anyhow. I also got in my reading. I have Thursday night bowling league at night. Either tonight, or tomorrow I need to build the desk for my wife. Just keeping on moving each day. Just got back in from an evening walk. It had been chilly here lately. Well, chilly for California. Still it isn’t so bad, once I am out moving for a bit. Today has gone well. I did eat about 10-15 minutes out side of my 5 pm eating schedule. My wife wanted a sandwich. So she was bringing me Togo’s Pastrami in a bowl again. She didn’t get home till 4:55 pm. Still, I ate it. It is times like this were I have been considering more of a 16:8 schedule for eating. Then I can go to 7 pm instead of 5 pm. Of course, I could move up my morning break to 1 pm instead of 11 am. So far though, I feel my body wanting that food around 11. Overall, Monday was alright. I’m a stay at home Dad, so there was no day off for me. My kid is out of school all week! Wife was not off either. We also have one vehicle in the shop, so I have no transportation anywhere during the day this week. I did have my Monday night bowling league. Struggled a bit. Bowled 191-160-193 I believe. Missed too many 10 pin spares, and got too many splits. That’s bowling though. You can’t always get all the breaks your way. MyFitnessPal Food Diary. 1433 Calories, 8 net carbs. Had a weird issue when I was trying to get to sleep. I suddenly felt hungry. Not a massive hunger or anything. Just a random thought from the brain “Hey, stomach wants food” Otherwise, food seemed fine. Seems like my Mondays are usually busy enough that I pass on getting my walks in. 12:01 am to 7:45 am. A little trouble falling to sleep, then a couple of random wake ups. I think my allergies might have been acting up some. In the morning, my wife took my son to his doctors appointment. I think she made enough noise to make sure I was waking up too haha. We have a meeting to attend tomorrow morning. It might be another later night walk tomorrow. Will just keep pushing forward. 50 days in. Time flies! So today, I am going to start off with my Motivational Monday. 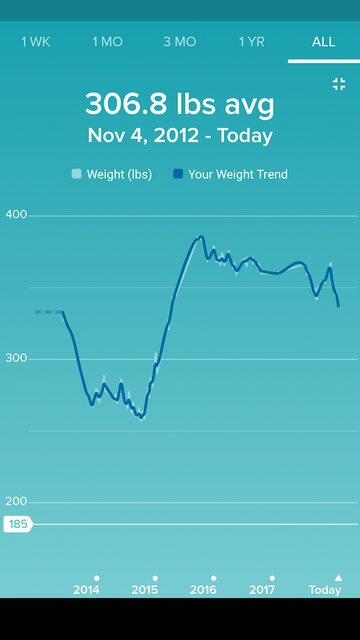 This graph on Fitbit represents my greatest failure. That big step incline there. That was me gaining back 128 lbs in less then a year. October 27th, 2014 I was 257 lbs. September 21st, 2015 I was 385. Now during that incline, I was really messed up mentally. It was more and more failures everyday. Thoughts of “What kind of person does this to them self” Even after I peaked, I was completely embarrassed. I was too embarrassed to even come back here. I was too ashamed of what I had let happen to myself. I wanted to get right back into lose it all mode. I just couldn’t. What seemed to work before, just would not help this time. Where I had the iron will to turn down whatever cookie/candy/donuts or whatever sweets showed up, I could no longer do it. Still, I tried. I did get myself back down a bit into the 360-370 area. But I stayed like that for like 2 years. Late 2017 I got the surgery scare from my doctor. I had a really bad blood test result. It looked like my body couldn’t do it anymore. Hell, I knew that though. Even without blood tests, I knew my body was breaking again. Even in the worst times, I did come to check out some people’s progress on Nerdfitness. The last year or so, I had also been watching the Keto subreddit. Very inspiring stuff. It wasn’t enough to get me to stick to it, but it was getting me there I think. After my Doctor saying she wanted me to really consider the surgery possibility, I knew I needed change. Like now or never change. At first I started by giving myself a slight timeline. Get things moving in the right direction, or tell the doctor you give in, and do surgery. 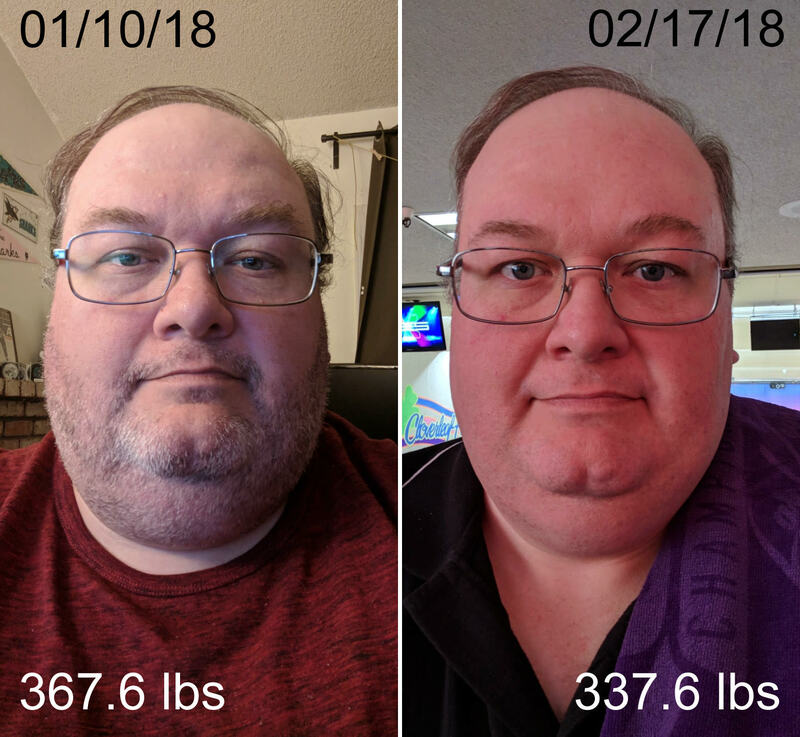 I started playing with Keto a bit. I wanted to see if I would be able to do it. Things were looking positive. I just wasn’t 100% committed to the process. It was easy enough to join on board with my wife in the “Well, I will just do better after New Years” So that meant I got to “enjoy” my Thanksgiving and Christmas by eating all the things. I noticed that the small positive I had made weeks before, was completely erased with all the bad I was eating. I was tired of that old me. It was time to bring back the new me. The Healthier me. The one that ran two Spartan races. The me that ran a 5k for the first time in my like. The me, that felt a lot better then the old me. As of today, I am the lightest I have been since April 16th, 2015. That was when I was on the uphill climb. So while this picture represents my greatest failure of all time. It also will represent my one of my greatest achievements. It will be this year, or next year, or even the year after that. That downward trend will continue. I will beat my previous low weight record of 257 lbs. I will get under 200 lbs. I will be, that healthier, stronger, much more badass version of me. 7 weeks in to the new year. The year I am turning my life around. This week, I weigh in at 335.8 lbs. That is 4.5 lbs the week, and 31.8 lbs since January 1st. 02/16 – 1583 Calories, 10 net carbs. Was eating a few minutes after IF window still, but close enough. Overall, great week with food. I have been able to stay with a 18:6 Intermittent fasting schedule. It is a little tough, and I may switch back to a 16:8 eventually. For now though, It is working fine. Not my greatest week, but better then last week. I went out 3 times this week to walk. My goal was to get out there 5 times. So room to improve this week. One night, I didn’t read this week. I did however get to bed at midnight. I didn’t always fall asleep right away. I also had a couple of really bad nights of sleep, which in turn made it easy for me to give up on walks and such. So this week, we kill it. Not just me, but anyone reading. Remember those New Years Resolutions? If you slipped, you slipped. Time to get back up on try to tackle it again. This will be a quick post. I need to head to bed asap! Overall, my weekend went well. 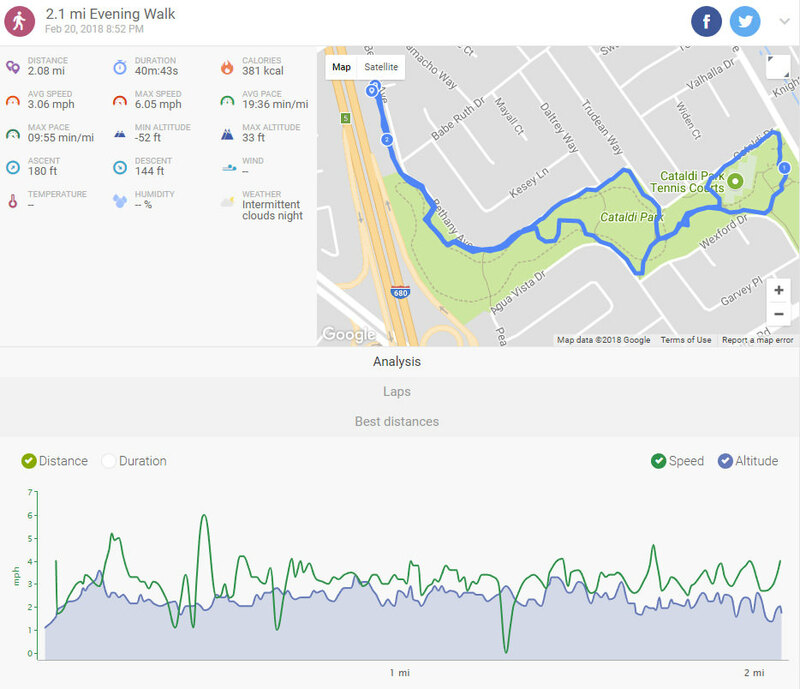 I got out and walked both Saturday and Sunday. I didn’t get to all the cleaning I needed to do, but I did get dishes done. My food was a higher in calories tonight, because I decided to get a Togo’s Large Pastrami in a bowl. It was convenient, but not that great tonight. Net carbs are all in check this weekend. I also hit my eating window 11 am to 5 pm. Today it was even more like 11:30 am. 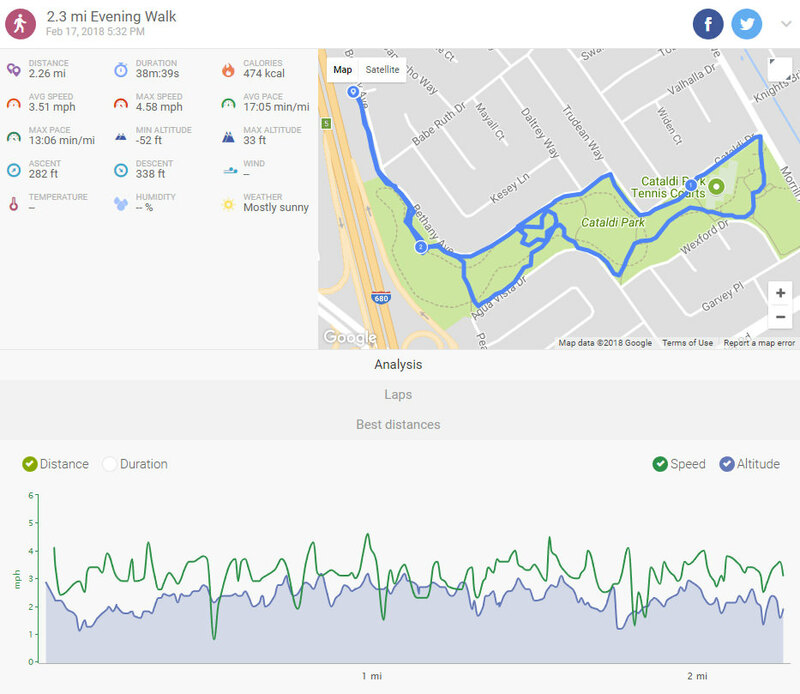 Good walks for both days. Today was really windy. 12:16 am to 8:10 am. Though, I do recall seeing 1 am on the clock. Must have just been a quick wake up. Of course, the waking up at the end is my wife getting up, and me trying to sleep though it. haha. Time to recap my week. This week has been a rough one for me, but I think I still made great strides overall. Hope everyone is still out there working hard on their New Years goals! Today felt like a win day for me. I even got out for my walk before the sun went down. We took one car into the shop to get worked on. Hopefully, it can be fixed without breaking the bank. Next stop was my son’s bowling league. I had my match club to bowl in the afternoon, so we were just all going to chill there. Since I wouldn’t be in my eating window yet, I brought some almonds to eat, once it was 11 am. Well, my son finished by 11 am, and wanted to go home. So off we went. Back home, I decided I would try to eat something real quick. Chicken meatballs, my almonds, and pork rinds to the rescue. It was enough to make sure I wouldn’t get so hungry during my bowling. Back at the bowling alley, I did really great today. I bowled 222-231-195 today. 648 total for my series.I ended up spending $10 in the 50/50 we do, and the strike pot. First game, my ticket got pulled for strike pot, and I got a strike on my next shot. That was worth $32. So then I pull the ticket for 2nd game. During second game, come to find out, I pulled one of my tickets! So I go up and strike. Add another $32 to my pocket. So I spent $10 today, and came home with $64 haha. I didn’t notice at first, but that is a 30 lbs difference. I think I can actually see some of the difference too. I know I am feeling it. Overall, today was a win. Friday was a second rough day. I think I have been putting extra stress on myself, and it made me feel worse and worse. MyFitnessPal Food Diary. Keto game is staying strong. I did finish eating slightly out of my eating window. I finished up about 5:10 pm. It just kinda worked out that way. I’m not too worried out it really. Nothing done on Friday. I did have the chance to get out, but elected to stay at home and watch some shows with the wife. So at least it just wasn’t me wasting time at the computer or something. I pushed it last night. I was a few minutes late to my reading time. I was getting my Nerdfitness post done, and posting my blog here. I did read right after though. I am getting closer to the end of book 2 in the Expanse series. Caliban’s War. I am really enjoying my read time. Then I was off to bed by midnight. I got in bed, then realized I left my fitbit out on the charge by my computer. So I hopped up and grabbed it. Fitbit tracked 12:07 am to 8 am for sleep. It did take me awhile to settle down still. Had a few moments of almost asleep… and awake! Eventually though, I got to sleep. I know I have some gaming to do later at night. I want to get a walk in, so maybe in the morning I can get to that. Plus there is all the cleaning up that still needs to be done. One step at a time! Another day of struggle in the exercise department. I have been back to feeling too overwhelmed to get other things done, which then makes me not get everything done. It is really weird. Today I did get some needed things done, so I am happy with that. I could have gotten my walk in tonight, but the wife wanted to catch up on some shows we watch together. So it wasn’t too hard for me to give up the walk for that. This week has been somewhat of a struggle. So I’m just trying to get through it one step at a time. I have my son’s bowling in the morning. I will have Match club bowling in the afternoon. I am hopeful I can get a walk in afterwards, but I do have lots of house clean up to get done. Some will be done Sunday, too I am sure. My food game seems to be on point. That so far is the one most important thing I have been able to stay steady on. Overall, it’s the most important thing to me as well, I think that is why I don’t let myself fail there. Not as bad as the night before, but not the best ever either. I was up, and on the computer until just about midnight. So I didn’t read. I fell asleep quick enough, but the morning wake ups killed me. I tried sleeping though it, but it didn’t help. Fitbit tracked 12:09 am to 9:39 am. 24 times awake though, for 50 minutes worth. Yuck, today was a down day. I got to bed fine, but my sleep was horrible. I think I was too worried on getting things done today, and of course, I didn’t. I was up by 8:30 ish, but I just stayed in bed till almost 10 am. So I don’t feel tired so much, but just felt worn down feeling. I didn’t do a lot of what I was planning to do. Though, it wasn’t all a complete fail. I did cook some chicken breasts, and did a couple of things. I had bowling tonight. There was 3 or 4 people, in the league, that had birthdays tonight. So of course, this is setup on the lanes I am bowling on. Funny enough, one of the ladies bowling on the other team is also not eating sugars and going low carbs. She made the comment that I was looking thinner. Then asked what I was doing. She has been eating low carb for about a month. We talked about how we both were not really interested in the cup cakes. Keto is pretty awesome that way. 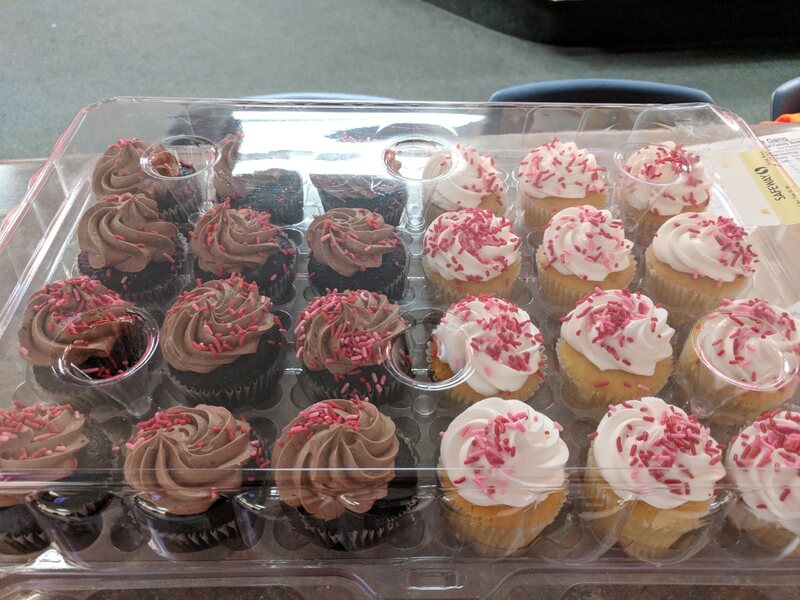 I do feel slightly hungry tonight, but I think that is most my brain trying to scream “EAT ALL THINGS!” when seeing the cupcakes. haha. Wednesday was pretty good day. At least when comparing it to today haha. MyFitnessPal Food Diary. 1675 Calories, 12 net carbs. Eating went fine. I hit my IF eating window. 12:10 am to 8:30 am tracked. I couldn’t really get to sleep, and then it felt like I was waking up all the time. Hopefully, tonight will be better. Well, I have a ton of things to do in the next few days. One major project is getting my pc area cleaned up. I need to get to the store as well, or the wife will at least. One day at a time!